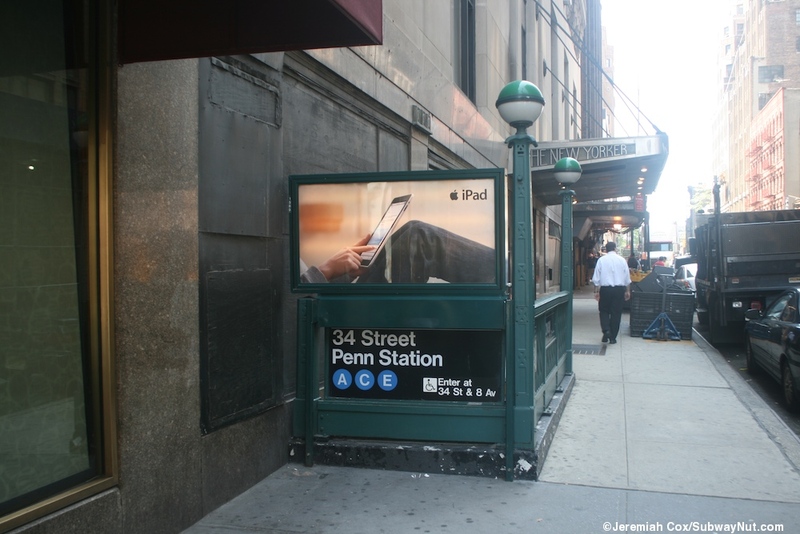 The A,C,E station at 34th Street-Penn Station could easily be the IND station (and definitely express station) that is closest to the surface. 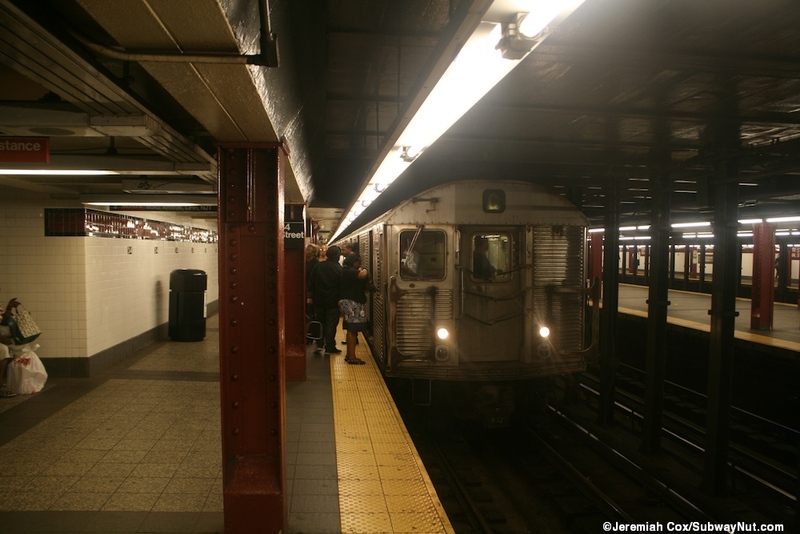 The reason for this is because the subway goes above all the railroad infrastructure beneath including Long Island Rail Road, New Jersey Transit, and Amtrak Trains that are announced and signed on exits throughout the station. 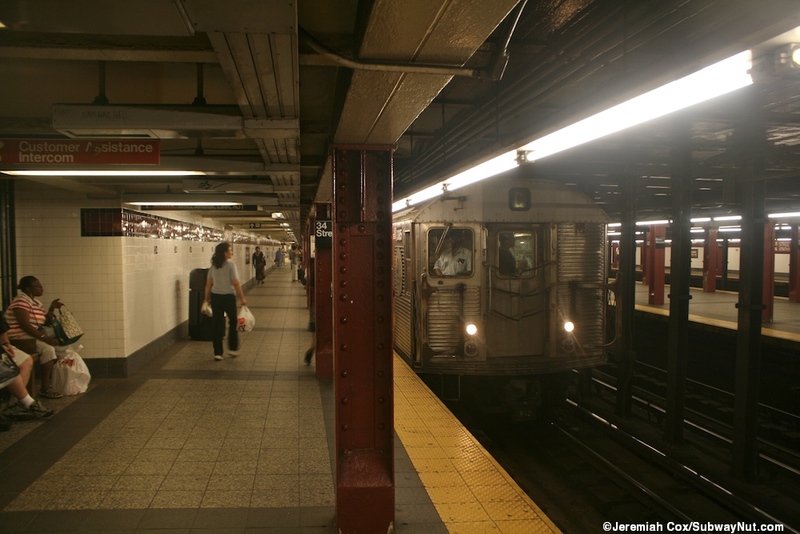 The station was one of the original stops of the IND 8th Avenue subway and opened on September 10, 1932 using provisions made by the Pennsylvania Railroad with station's opening in 1909 to encourage and incorporate the building of an 8th Avenue Subway Station. 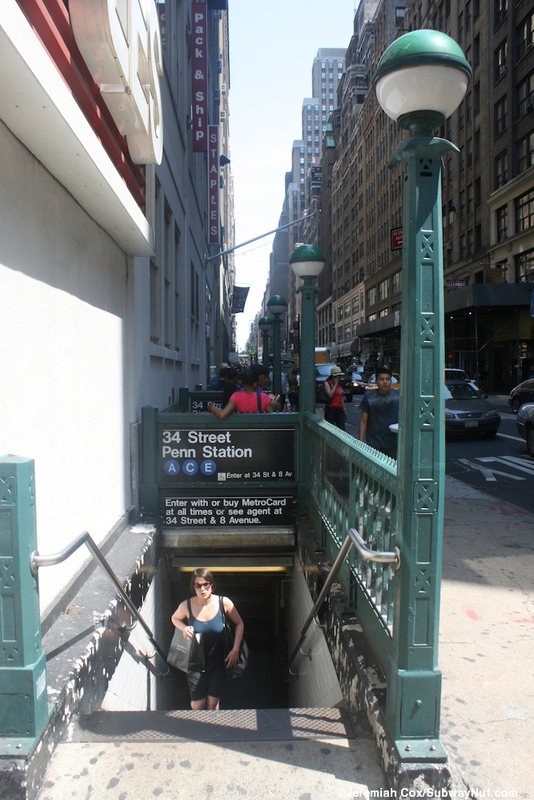 The stop also has an extremely unique layout only shared with the 34th Street-Penn Station stop on the 7th Avenue line that has a similar just beneath the street design on the IRT Line. The layout for the four track line is two side platforms for the C, E local tracks and an island platform shared by the two express tracks. 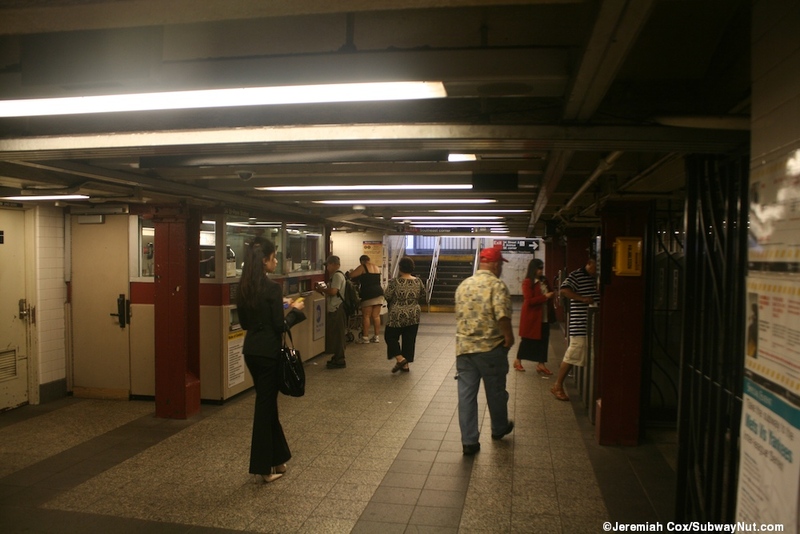 There are no staircases up from the Express island platform, all exiting is done by going down below to underpasses. The side platforms have on platform fare control mezzanines. It is definitely a stop where passengers go on dashes down via the underpasses to change sides. The free cross-unders are only at the middle and northern ends of the platforms. If your unsure (such as at the beginning or end of A local overnight service) of the platform your train will arrive on wait by a staircase in the middle or towards the northern end of the platforms. 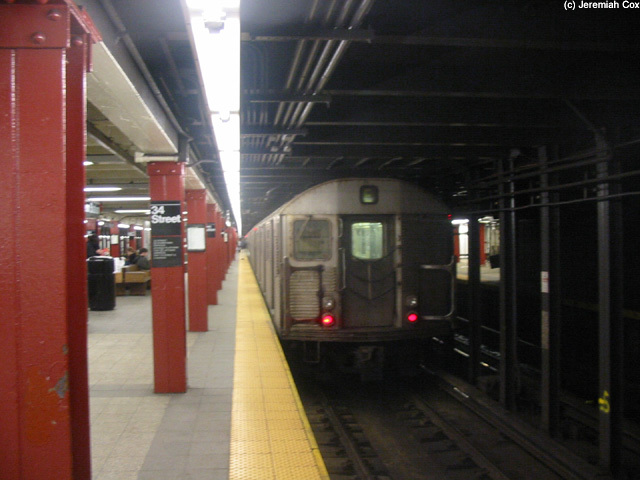 In addition, the express platform is offset and runs farther north from the local platforms. 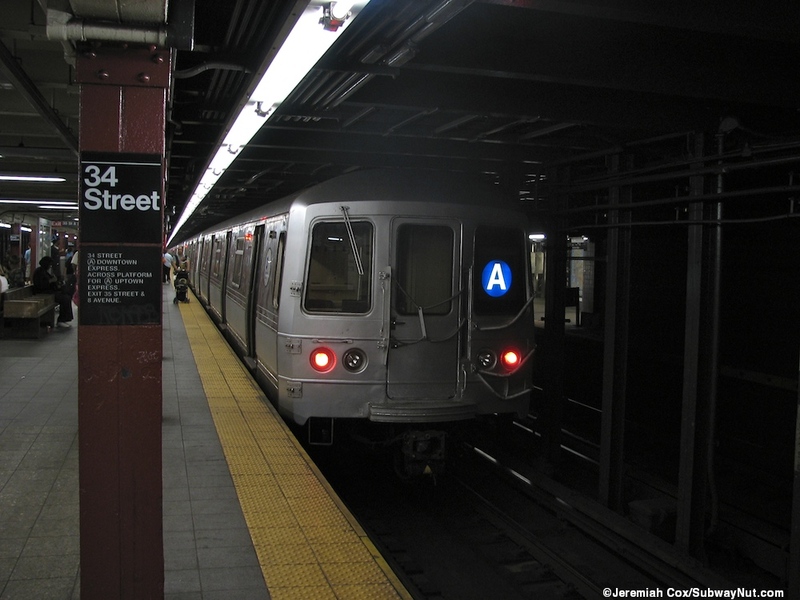 Also A trains on the express platforms stop slightly offset from each other with uptown A trains slightly north of downtown A trains. This portion of the island platform has walls along the track where trains don't platform. 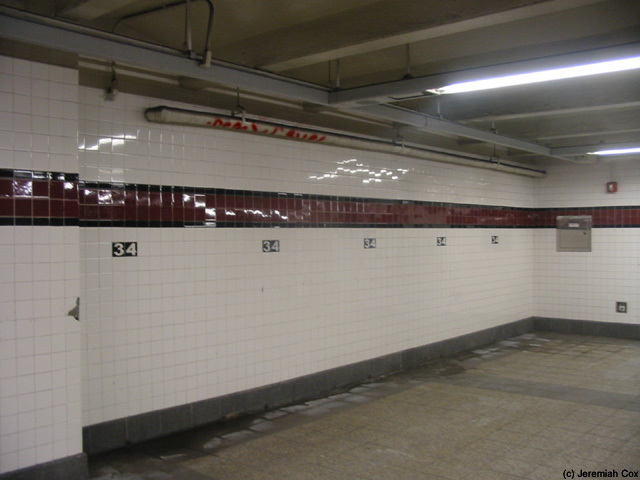 These walls are fully tiled with the same trimline as the local platforms. 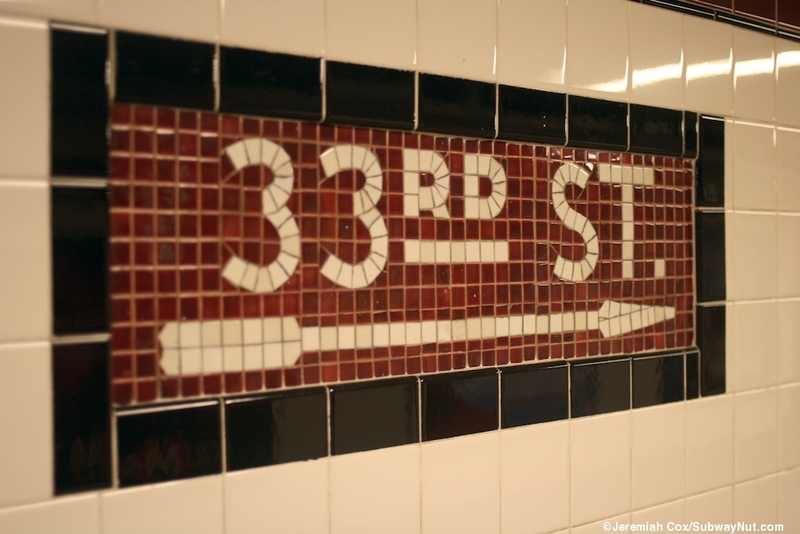 At the northern end of the platform it also includes little black 34s for 34th Street. Along each track is a series of maroon colored columns. The station was last renovated in 2003 that included retiling the local platforms and making the station fully ADA compliant. These platforms have a two tile maroon trim line with a black border. 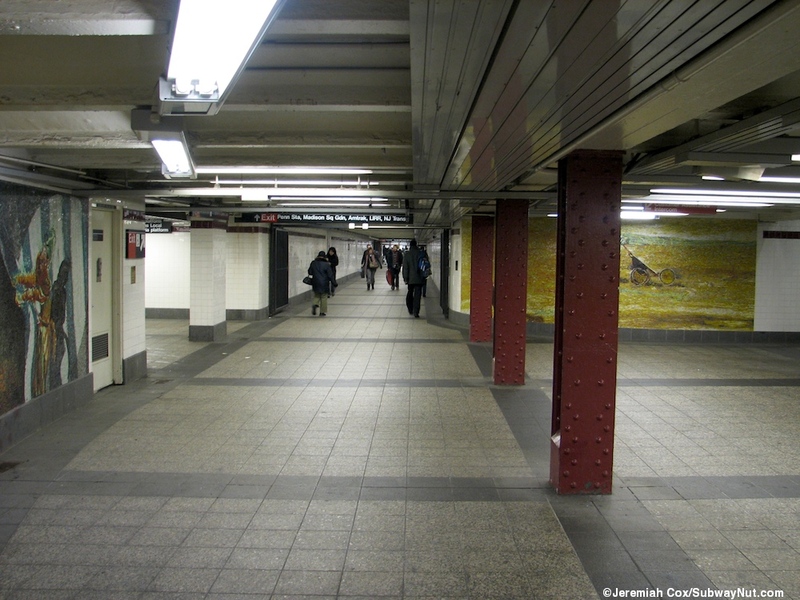 The station's mezzanine and underpass have similar trimlines just one tile wide. 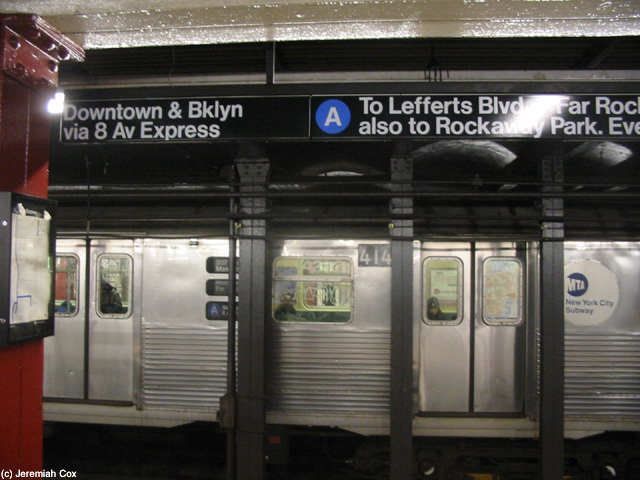 The tops of name the large tablets directly break-up the trimline with white text on the same maroon background, a black border and say 34th Street-Penn Station. The name tablets alternate with maroon directional mosaics in the center of the wall, these are clearly not original since they Madison Square Garden with an arrow towards the Penn Station end of the station. This is the modern arena that was built when the grand Penn Station in the 1960s was demolished. At the northern end of the local platforms, towards the northern end of the express platform (be in the second car) a simple, narrow underpass connects all three platforms with a staircase up to each. I have a feeling there was a continuous mezzanine all the way beneath the station and the exit to Penn Station could be accessed from here but it was cut-off by the lost property unit. On the local platforms are on platform fare control areas with turnstiles both high and low but all token booths removed. From the downtown platform two streetstairs lead up to the NW and one to the SW corners of 35th Street and 8th Avenue. The downtown platform is the mirror image with two up to the NE and one up to the SE corners. 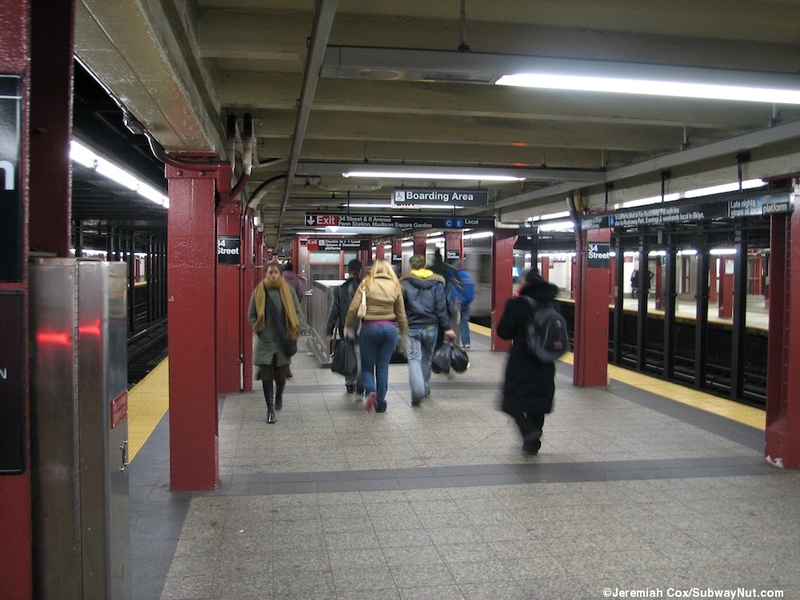 The middle of the platform contains the exits to 34th Street. 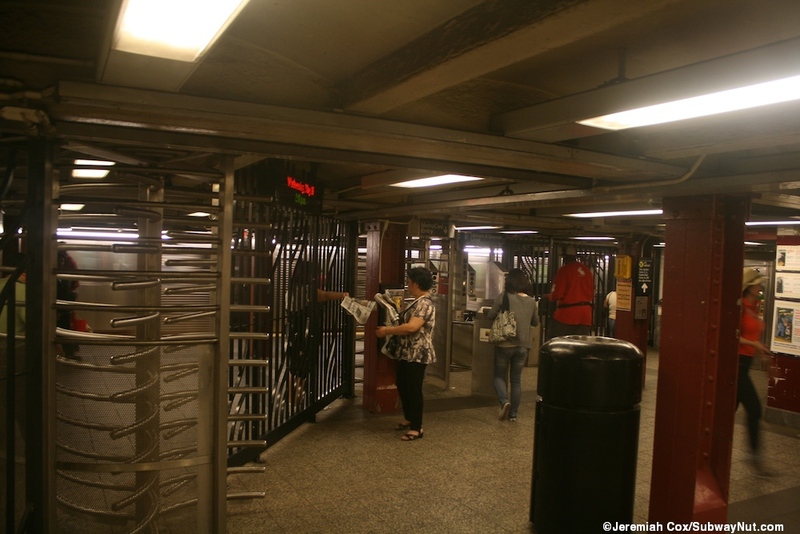 On the uptown platform are turnstiles and streetstairs up to the NW and SW. The downtown platform has a streetstair at the NE and SE corners and the SE corner also contains the ADA street elevator, a single staircase from the local platforms and seperate platform elevators lead down to a mezzanine beneath the platforms. This mezzanine has two staircases and an elevator down from the express platform in this area. 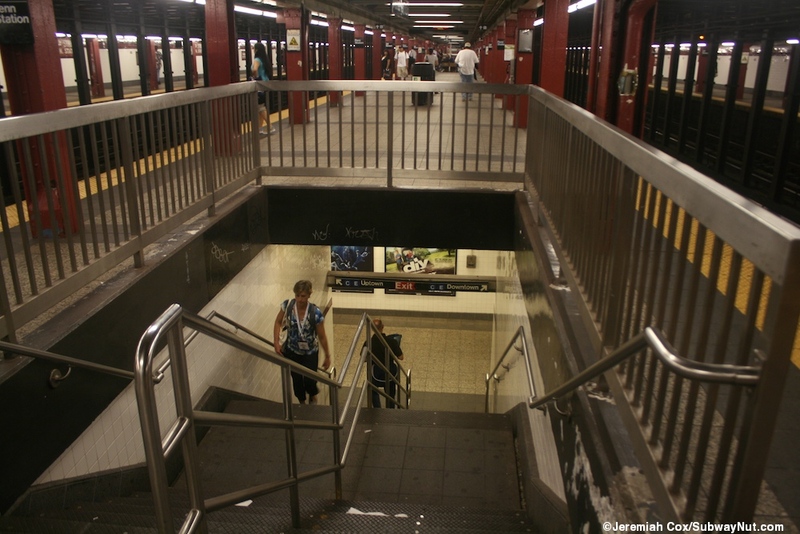 This mezzanine has the entrance to the Lost Property Office at its northern end and becomes narrower continuing a block beneath to 33rd Street where two more staircases lead down from the express platform. It ends (without any more local platform staircases) within fare control at a wide bank of now unstaffed turnstiles that provide the main access into the awful subterranean maze that is the current Penn Station through the main 33rd Street Connecting Concourse. 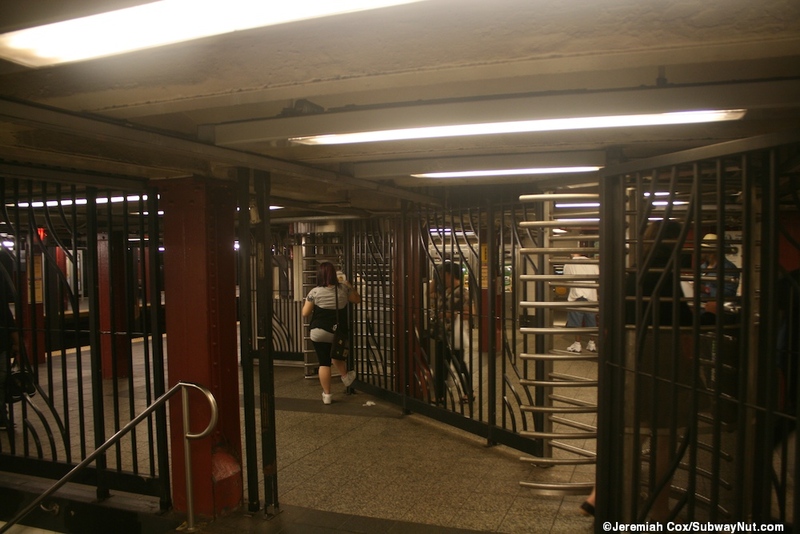 These turnstiles also allow step-free access to Penn Station's platforms and its elevator entrances (plus an out of system step-free transfer to the IRT). 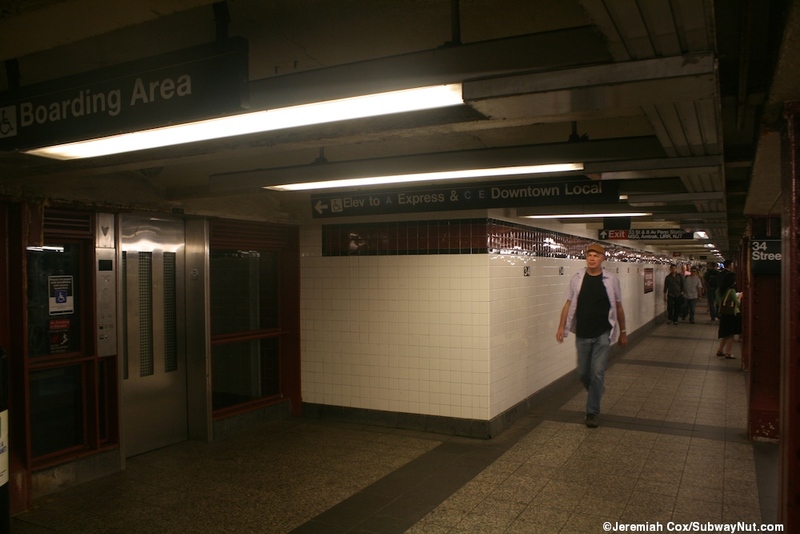 On the east side of this exit area a ramp leads up, past a name tablet that says 34th Street Station to the main northern concourse at the northern end of all the station tracks. 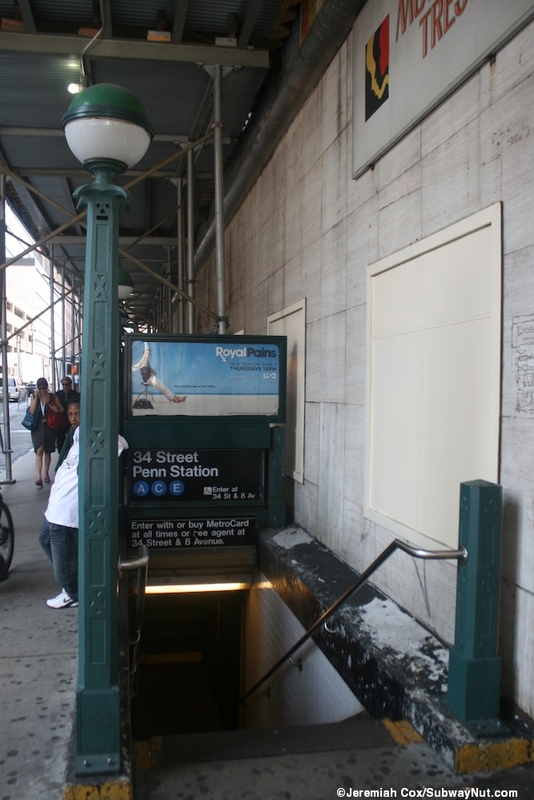 On the west side a staircase leads up to a fare control area for the downtown platform and a passageway leads to the LIRR's West Side Concourse (via this subway entrance is the only way to access it) that provides additional entrances and exits to and from tracks 13 to 21. Amtrak and New Jersey This concourse opened in 1986 and is only accessible through the subway station. Beyond the end of the express platform and above this express platform only fare control area area is the final on platform fare control areas for the local platforms. 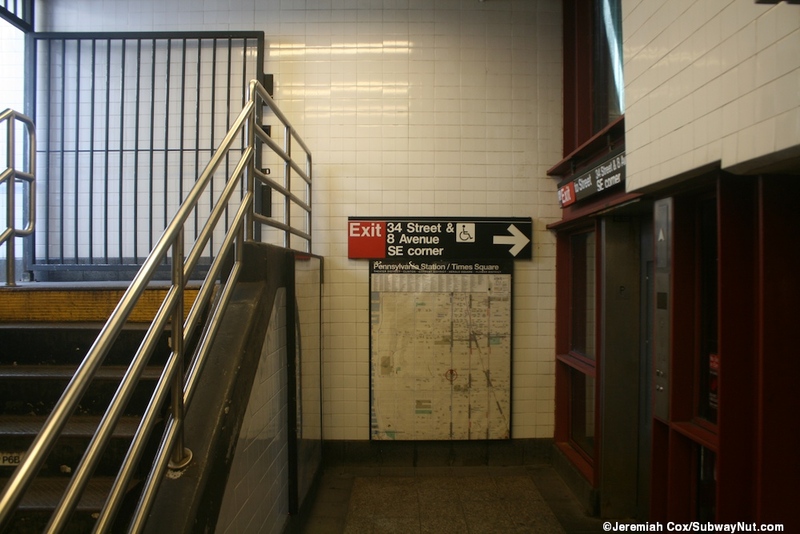 On the Uptown side the turnstiles and full time token booth lead to two streetstairs one to the SE and NE (in front of Madison Square Garden) corners of 33 Street and 8th Avenue. A very wide staircase leads down to the main northern concourse of Penn Station. 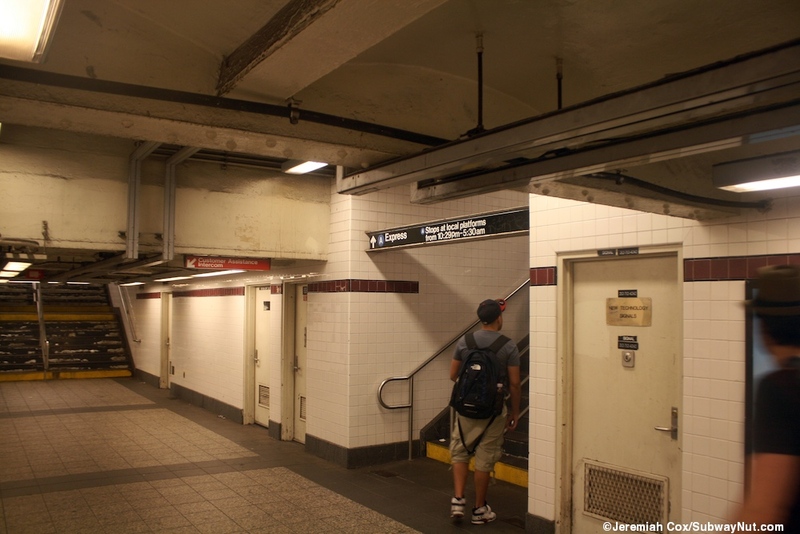 The downtown platform also has a token booth and the turnstiles lead out to two staircase down, one leads directly to the LIRR West Side Concourse and the other to the Express platform fare control area and all access into Penn Station. In addition two Streetstairs lead up to the SW and one up to the NW corners of 33 street and 8th Avenue. 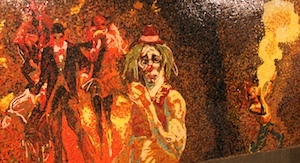 A mosaic on the mezzanine for 33rd St.